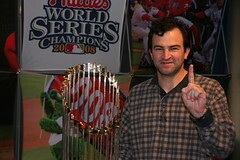 In what is truly a brilliant move to get Phillies Phans to come down to the park and buy more 2008 World Series Champions gear, the Phils made The Commissioner's Trophy available for photos today. After waiting for about 30 minutes in line, I got my chance to actually touch the trophy and pose for a photo. Carlo and Ann were right behind me and we got a nice shot of them too. I am guessing thousands of folks came out to the park today to see the hardware. My photos from the day are up here.